Welcome to weekend eve and as January is a five week month we have the ever popular tag Friday post for you. There are no restrictions or themes for this event so the Creative Guides just have fun putting together a tag of their choice. Let's see what they have for you to feast your eyes on today. 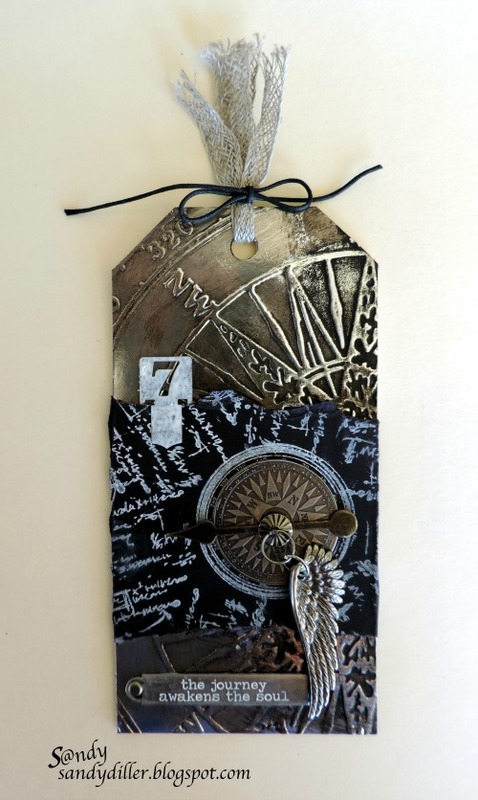 This tag started out as a stencil monoprint mop up that I'd made in December while making my version of Tim Holtz's December 12 Tags of 2015. I had used Tim's Poinsettia layering stencil and the flowers and red colour immediately reminded me of a valentine, so I added a cascade of hearts to complete the Valentine's Day trifecta! 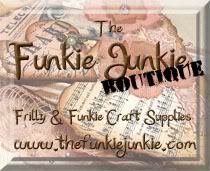 Come on over to my blog for all the details. 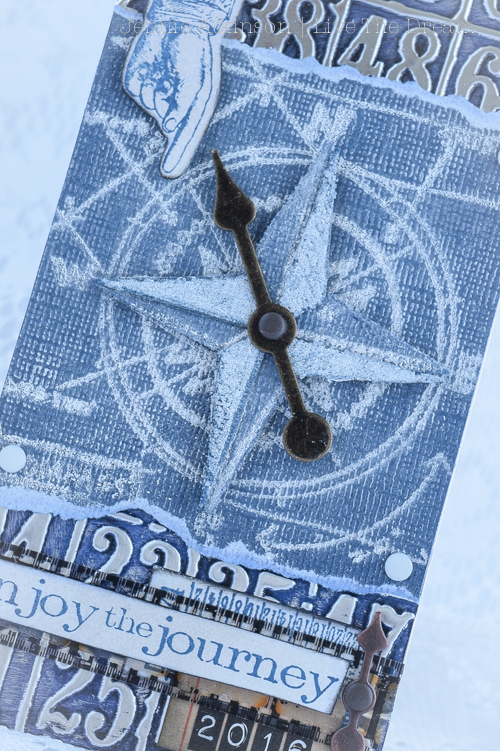 I am sharing my January Tim Tag for our Tag Friday showcase. I had great fun changing around the colours and experimenting with the techniques on linen cardstock to create a totally different feel. 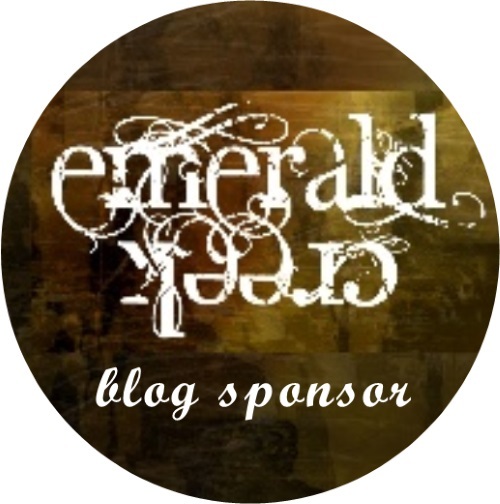 Please join me on my blog if you would like to see some more details. Travel is what's on my mind with this tag that is serving double duty. It's also my Tim tag for January and it is packed with lots of Tim goodness. I added the #7 at the top of the band because that is the month we will be enjoying our big adventure. 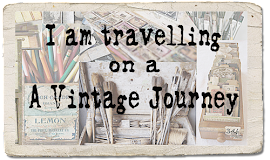 Having been doing lots of journalling and creating in bright colours recently I wanted to get back to some vintage collage. 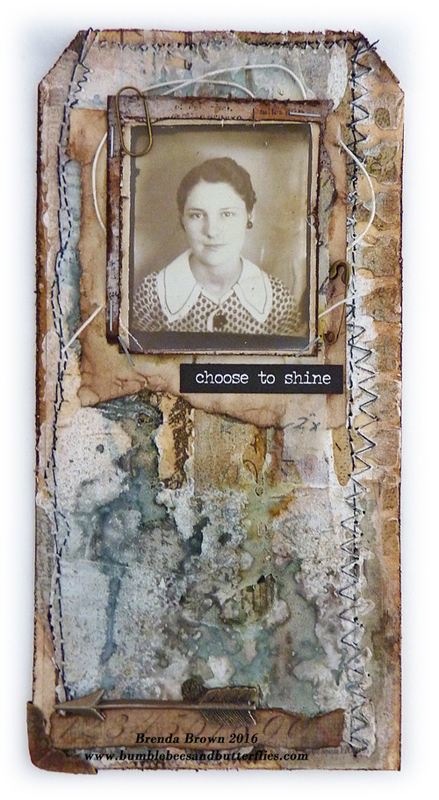 Using Tim's papers, photo booth picture, distress sprays and some ideaology combined with a mixed media background - this just appeared and I'm really quite happy with it. I hope you like it too. Often I use Tag Friday as an excuse to play with my favourite colours and stamps. This time I used it as a nudge to experiment with a slightly different style and colour scheme. If you'd like to check out some of the influences and see a few more details, do come and visit Words and Pictures. 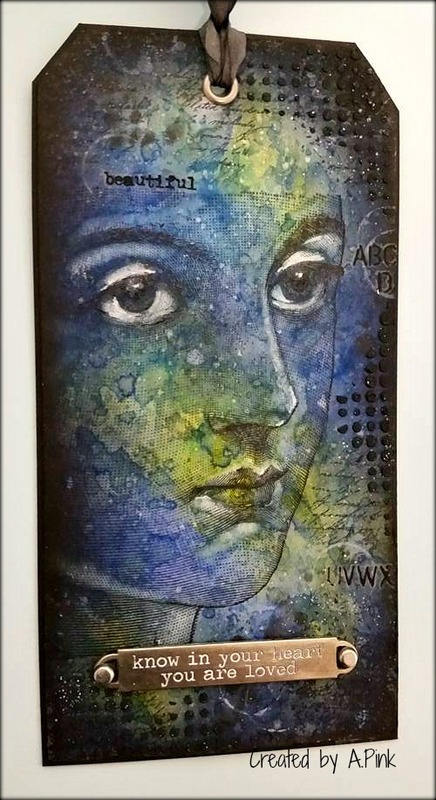 My tag was born out of my love of facial imagery and expression, especially the eyes, as they truly are the windows to the soul. 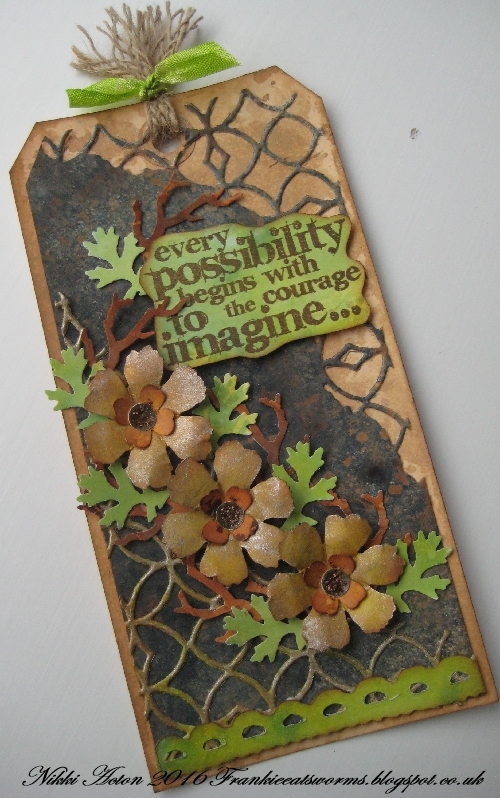 If you would like to see how I created this tag there are more details on my blog. 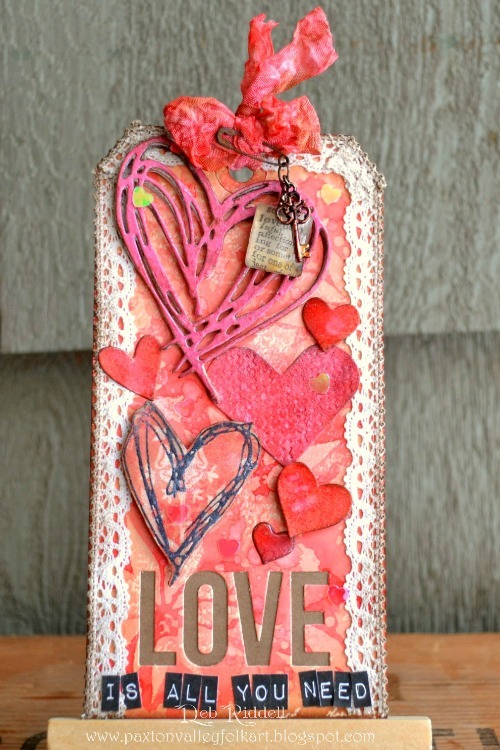 I was short on time for this tag so I raided my scraps box and found some mop up tags and inky scraps. 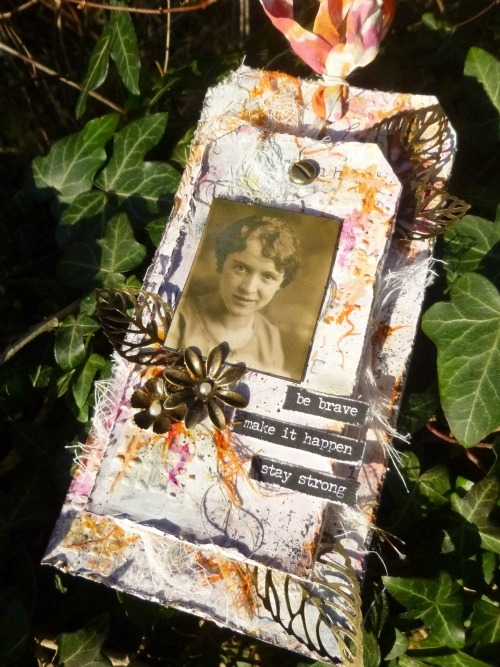 These scraps are great for using with punches which I used for my flowers, twigs and leaves. There are more details today at Addicted to Art. What a dose of inspiration if you need one. My thanks to all the fabulous team members who have contributed to the TF post for January. I was just checking the calendar and we only have four more for the rest of the year so keep your eyes open for them. A fabulous mix of styles and techniques from everyone. Thanks for sharing your unique creations for a superb Tag Friday post. Wonderful tags from you all, great inspiration like always!! I'm thrilled by each of these tags, what an inspiring post!!! love the tags. thanks as always for sharing. AMAZINGLY FABULOUS inspirations.... wow. Each one is stunning in a different way. What a TREAT this was to see them all. WOW... thanks bunches.j. Wonderful inspiration! Thanks for sharing, ladies! A stunning selection of tags ladies and so inspiring. Fabulous tags everyone! So very inspiring indeed! I'm even later than Jennie, so apologies from here too - but all this fabulous inspiration was well worth the wait! A superb post of wonderful and inspiring tags.